Listen up people. The Good Doctor recently dropped into San Francisco for the winter sales, jumped the Caltrain to San Jose and bagged him a bargain. Three for the price of one, plus a surprise bonus. What are we talking about? Only a one night stand with Andy Santana, Aki Kumar and the legendary Gary Smith, that’s what. Oh, and a Sunday morning helping of Dave Earl. Now we don’t make this stuff up. As Andy Santana’s band took the stage, the San Jose Sharks fans were busy fuelling up for their scrap with the Minnesota Wild. It was t-shirt weather (in January for crying out loud) and the local brew was tasting just right. Time for a winter feast of west coast blues harmonica. 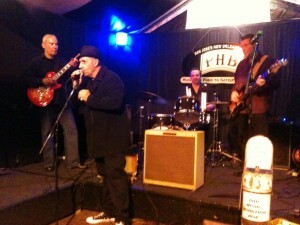 The Good Doctor disembarked the Caltrain at San Jose station and made a bee-line across the car park, through the Sharks fans, to the Poor House Bistro, arriving just as Andy Santana was stepping up on stage. For those of you in the know, Andy needs no introduction. Those of you new to the name should Google a while. 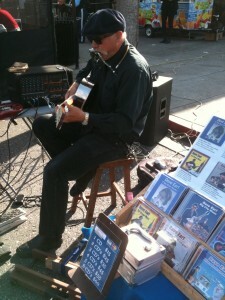 Andy delivers big time on the West Coast blues harp and guitar, make no mistake. And his stellar backing band for the evening comprised no less than Bob Welsh Jr on guitar (Elvin Bishop band), R W Grigsby on bass (Mark Hummel Band) and Hans Bosse on drums (first call in the area). Andy Santana himself is a pedigree bluesman from the hood; he was frontman for the Soul Drivers in the 1980’s. A lineup that included Mighty Mike Schermer and June Core. As the Good Doctor chilled out with a tall glass of chilled beer, Andy and the band ran through a harp instrumental, followed by Little Walter’s Mellow Down Easy and a jump blues, Hey Let’s Party. Andy then switched to rhythm guitar for the next instrumental which featured Bob Welsh on lead guitar. One mean axeman. No wonder Mark Hummel has snapped him up. 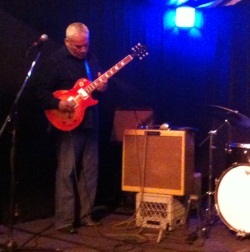 At this point, Gary Smith walked in and dumped his Fender Bassman amp centre stage. Hunched in a winter coat, black Converse sneakers and trilby, you’d be forgiven for thinking he’d just left the soup line. At the end of a Chuck Berry style rocker, Andy called Mr Smith to the stage and they launched straight into Sonny Boy II’s Don’t Start Me Talking. Next came Jnr Walker’s Cleo’s Mood, then a Frankie Frost My Back Scratcher style intro to Buddy Guy’s When My Left Eye Jumps. I don’t know what the soup was like, but the harp was piping hot. Gary left Andy to finish the set with Please Don’t Hurt Me No More. Time for more brews. As we tucked into buffalo wings, sweet potato fries and beers, Andy opened again with Little Walter’s Off The Wall, before the Harp Surgery’s good friend Aki Kumar stepped up to join him. Andy’s harping was sublime. Aki’s was Hollywood. As a duo they were a box office smash. Aki attacked with energy and precision. Andy’s reply skipped and tantalised. It was beautiful stuff – crafted, yet somehow visceral. Aki steered procedings until the two harps fell naturally into a call and echo sequence. The audience was spellbound. 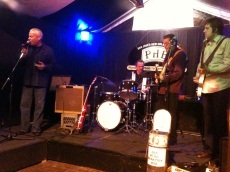 For the record, Andy was blowing through his Sonny Jr amp, while Aki used Gary Smith’s Fender Bassman and bullet. Down The Road I Go provided a killer 3rd position break, before Gary Smith was invited back on stage for a three harp delivery of his own number, Rocket Ride. Gary explained he had written it by combining the best of James Cotton’s Rocket 88 and T-Bone Walker’s Ride Wit Me. To infinity and beyond! The Doc has never seen anything like it before. Probably never will. 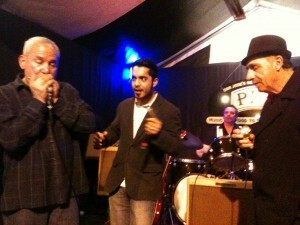 Three part harp with Andy Santana, Aki Kumar and Gary Smith? The harmonies were tighter than the Andrews Sisters’ stays. Walking to brunch next morning in downtown Campbell CA, we hear strains of a 12 bar through the farmers market stalls. Earl Smith is out busking. Bonus! If the blues harp is milk, San Jose is a cow palace.